So y'all probably know I have a lot of stamps. I am rich in vintage postage, both from my Grandpa's old stamp collection as well as my many purchasing ventures. I'm now putting a few for sale in the new vintage postage section of my etsy shop. Many of you also know I'm Jewish, so I'm not going to use the many Christmas stamps that have come my way in various stamp lots. I've just posted two different listings for holiday/Christmas stamps that people other than myself will probably be a lot more interested in. This Vintage holiday greetings postage book is in excellent unused condition, with 20 29-cent stamps. Perfect for the current postcard rate! They are glue-backed, so you do need to moisten for the adhesive. 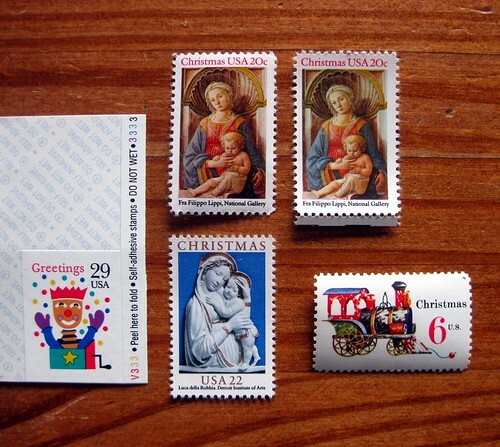 Also, a smaller lot of 6 unused individual Christmas stamps. 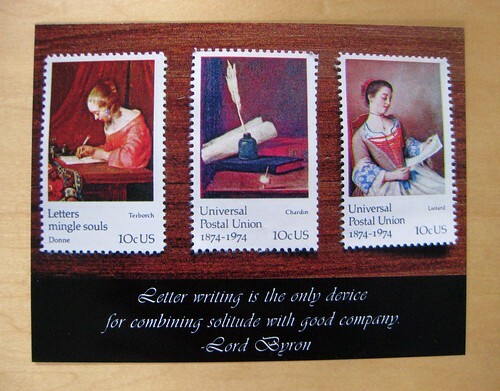 ...like the stamps pictured on this postcard. What do you think? Would you be interested? Should I sell other vintage stamps? Feedback most appreciated! I was just in communication with a fellow named Murph (which I probably learned about through YOU!) to look into some vintage holiday stamps...I like the small batch you've listed and I REALLY like the postcard you have. I've put it in my list of favorites at Etsy already! 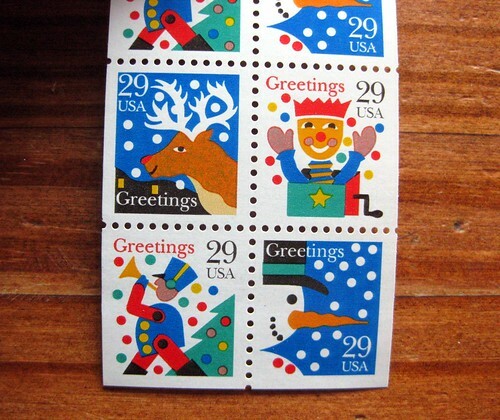 I like your idea of selling the holiday stamps, since you don't use them - there have been some fun designs in the past. Hello! 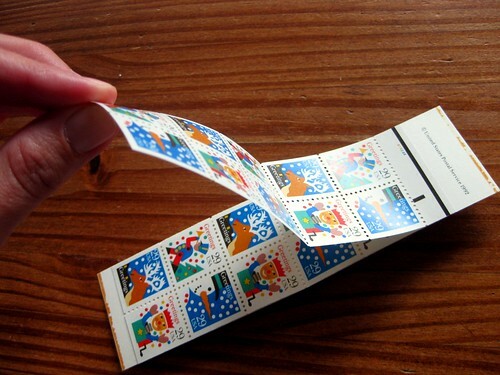 I had a look at the stamps on your Etsy store & I'd definitely buy them if they were being sold at face value. But the mark-up is a bit too high for my taste. Medusa - both etsy and PayPal take fees for each transaction, plus a percentage of the total. If I sold for face value, I'd be taking a significant financial loss. I've checked out other etsy sellers of vintage postage, and their markups are as much or more than mine. I'm offering free shipping within the USA, too, so I built that cost in for shipping and handling. That being said, I hear you - I don't usually pay more than face value for stamps myself, plus shipping... except on something I reeeeeally want. Then I make exceptions. It's a personal decision, and I respect yours. I ♥ U.S. Postal Workers! One more for Halloween postcard?